Event Description: A riveting site for a corporate team building event, Roma – the Eternal City – is one part modern metropolis, one part open-air museum. Rome was not built in a day, as the saying goes. Nor can it be seen in just 24 hours‹not when you have more than 2000 years of historical sights to encounter, free, on the streets, in the parks, pretty much everywhere you look! 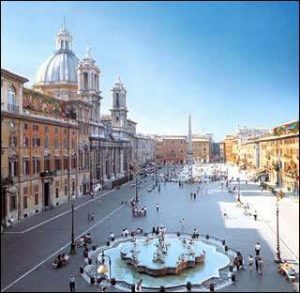 During your corporate team building treasure hunt…you’ll explore one particularly dense and fascinating section of the city: the scenic back alleys and piazzas stretching from the Piazza Navona to the renowned Trevi Fountain. Expect to peek into the Roman-era Pantheon; discover the birthplace of a famous opera composer; and dine on Rome’s most mouth-watering gelato, and much, much more. When it comes to treasure hunts, all roads truly do lead to Rome. Gather in the Piazza Navona. See our other Rome corporate team building events.